If you want to take on a task not relating to farming, you can talk to the Part-time Job Agency recruiter to accept a small day job. You'll find a recruiter by the Great Buffalo state in Westown, by the bridges in Tsuyukusa, and near the bonfire in Lulukoko. The three recruiters share the same list of day jobs, and each day new jobs will be available. Completing day jobs will earn you a little bit of money, raise your Town Link Ranks, and increase your friendship a little bit with the person who was looking for help. The summary of each job will be listed on the recruiter's log book along with the base pay offered. The greater your day job degree (which increases as you do more jobs), the larger the multiplier applied to the base pay once you complete the job. 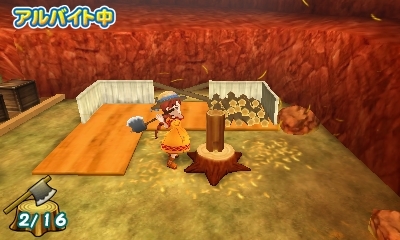 You also get a small pay bonus based on the current Town Link Rank. There are three types of jobs you can accept. These are basic type of jobs where villagers just need someone to do a chore for them. These jobs will take no more than 30 in-game minutes to complete regardless of how long you actually spend trying to complete them. You can't quit a chore job once you have started, but you'll get paid as soon as you complete the job. There are a wide variety of chores that are available. You could chop wood, water someone's crops, harvest a fish basket, or even brush cows. These chores won't take very long to complete, and most of them are pretty easy to do. The only chores that have ever given me a challenge were the weeding chores. When helping Iluka and Umekichi with picking up the weeds around their yards, the wild weeds slightly blend with the color of the ground, making them harder to locate. Sometimes the weeds will appear inside of the tall crops that Umekichi is growing in his paddies! They are there, you just have to keep looking. At the end of the job you'll get to keep the weeds though. If you take on the same type of job for the same client (except for the weeding, medicine tester, and room cleaning chores), after three completed jobs you may receive a bonus item along with your pay. This could be cooked dishes, herbs, downy tufts, and fish. Tototara sometimes gives out White Pearls. NOTE: You may experience a progress glitch in the game if you accept the Sheering or Milking chore jobs when you don't own clippers or a milker. Technically, your employer gives you these tools but occasionally they don't do that. If this glitch happens and you can't complete the job, you have to close your game and reload back to your last save point. The village shopkeepers Miranda, Lisette, Moriya, Ethan (at the post office), and Ludus need someone to make package deliveries this day. These jobs are available before the merchant opens their shop and then become unavailable in the recruiter log once their shops are closed for the day. Sometimes the merchant is offering multiple jobs with deliveries to the same town, allowing you to grab a bunch of packages at once and then deliver them to the same place. 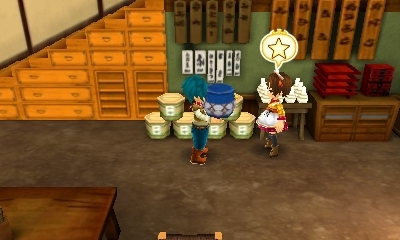 Once you accept the job, the supplying merchant will have a Star icon above his or her head. Talk to the merchant to receive the packages, which will not appear in your bag so you can't simply claim them as your own. Locate the recipient the merchant wants you to deliver to, who will have an equivalent star above his or her head. Then just press the A Button to make the delivery. The delivery needs to be completed before you go to bed for the day. Payment for delivery jobs will be given to you the next morning when you wake up. You won't get paid if you forget to make the delivery, but it also doesn't negatively impact your friendship with those involved if you don't do it. If you forget who you are suppose to be delivering to, open your main menu by pressing the X Button and then select your communication menu. From within the Job Memo you'll see a list of your accepted deliveries. These jobs are issued by faceless villagers who need you to sell a specific type of item from your farm by the time your shipments are picked up, which occurs around 17:00 each day. The job may ask you to ship vegetables, flowers, eggs, milk, and so on. The town you are currently shipping to will offer these jobs to the recruiter; for example, when your shipping bin destination is Westown the recruiter will only offer shipping jobs from Westown. You are free to ship whatever it is that matches the shipper's criteria. If the job is to ship 5 vegetables, then you can put in any 5 veggies in your shipping bin. For "flower" shipping requests you must ship flowers that you've grown on your farm; the wild flowers you pick up off the ground will not fulfill the shipment order. Payment for completing these jobs will be given to you the next morning. After you have completed Farming Tips #1 and you have reached Fall of your first year or later, the day-job recruiters will randomly have special gold jobs available. 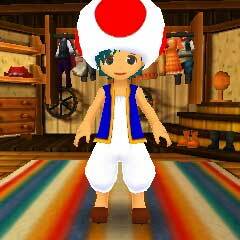 These jobs are not difficult, but their rewards are special; your payment will be clothing and coordinating hat based on Nintendo's Super Mario Brothers characters. Wearing the complete outfit will trigger a Food Power that lasts for 2 hours. 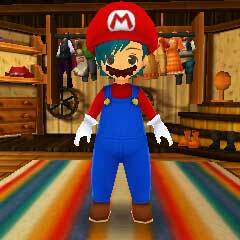 If you go to bed wearing a Mario Brothers costume, the next morning you'll wake up with the status effect too. Going into your closet to put on the costumes will also trigger the effect. The Mario and Luigi hats come with moustaches. Mixing and matching the hats/clothing will not trigger multiple status effects. You've to wear both matching pieces for it to trigger.